Studio: MS Entertainment Co., Ltd. In 1988 the Japanese government drops an atomic bomb on Tokyo after strange experiments go haywire. 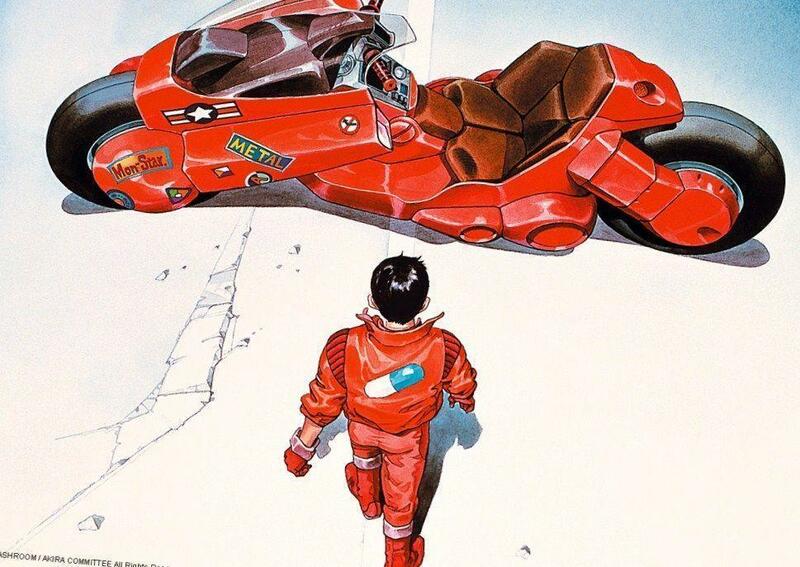 Thirty one years in 2019, Kaneda, a bike gang leader, tries to save his best friend Tetsuo from a secret government project after an accident. Kaneda battles his way through corruption, irresponsible adults and the military until finding out Tetsuo has developed supernatural powers that resulting in catastrophic events leading to a final encounter fought in Tokyo Olympiad where the government’s secrets are exposed. Shōtarō Kaneda walking towards his technologically and aesthetically iconic motorcycle. A nuclear explosion occurs destroying Tokyo. 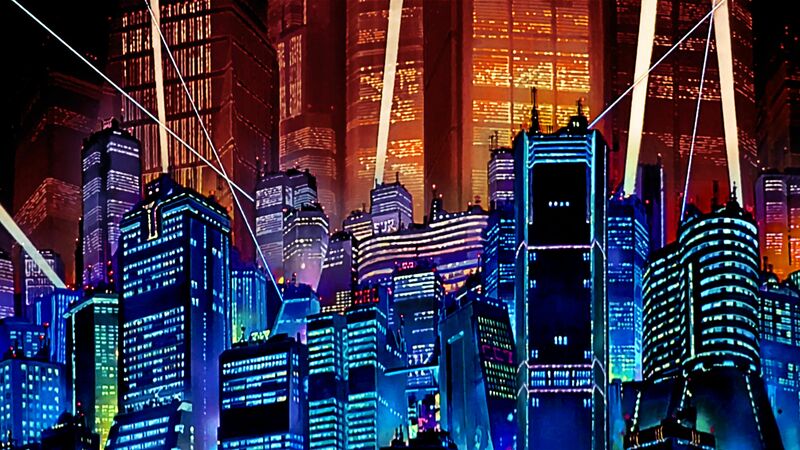 Upon its destruction, a new city is rebuilt and named Neo-Tokyo but it’s constantly plagued by corruption, protests, terrorism, and violence. During a large protest, Shōtarō Kaneda leads a biker gang, the Capsules, to a highway chase against their rivals, the Clowns. Kaneda’s best friend, Tetsuo Shima, accidentally crashes into Takashi, an esper walking in the middle of the street who escaped from a government laboratory with the help of a resistance group. This accident awakens psychic powers in Tetsuo ultimately attracting the attention of the government project lead by Colonel Shikishima. Shikishima recaptures Takashi with assistance by another esper Masaru, takes an unconscious Tetsuo while arresting Kaneda and the rest of his gang. While at the poilice station, they are being interrogated and Kaneda meets Kei, an activist belonging to the resistance movement, and tricks the authorities into releasing her and his gang. Colonel Shikishima and his leading scientist, Doctor Ōnishi discover that Tetsuo possesses powerful psychic abilities similar to Akira, the esper responsible for Tokyo’s destruction years ago. A third esper by the name of Kiyoko forewarns Shikishima of Neo-Tokyo’s impending destruction. The government disregard Shikishima’s warnings. He decides that it would be best to kill Tetsuo now to prevent another cataclysm. Tetsuo finds the strength to escapes from the hospital, steals Kaneda’s motorcycle, and prepares to run away from Neo-Tokyo with his girlfriend Kaori. The Clowns catch wind of them leaving and ambush the two of them. The Capsules arrive to help but in that moment the Shikishima arrives to find Tetsuo suffering headaches and hallucinations. He is taken immediately back to the hospital. Kaneda finds Kei and asks to join her resistance to help find Tetsuo after overhearing their plan to rescue the other espers. The animators successfully brought 2D animation to life by hand painting each individual light source. At the hospital, the espers confront Tetsuo through bizarre hallucinations provoking him to fight back with his newly developed psychokinetic powers. In the process, the adrenaline and power makes him egomaniacal and unable to use any emotional intelligence. Angered even more he escapes once more to his former gangs hideout to obtain drugs that will ease his pain. In the heat of the moment, Tetsuo murders a gang member and once Kaneda arrives to discover the tragedy he decides to stop Tetsuo. Tetsuo rampages through Neo-Tokyo, destroying everything in his path to find Akira’s cryogenic storage dewar in the stadium. Kiyoko gives Kei powers to fight Tetsuo but she is easily defeats her and exhumes Akira’s remains. Kaneda arrives to fight Tetsuo in a duel only to have him escape from the pain he is starting to feel grow even stronger. A satellites orbital weapon targets Tetsuo, shinning a bright blue light from above. Tetsuo is now in enormous amount of pain and losing control over his powers. Kaori is frightened by Tetsuos behavior. Shikishima offers to help Tetsuo by returning to the hospital, heal his injuries, and help him control his abilities. Kaneda arrives to interrupt their conversation by firing his rail cannon. At this point, Tetsuo starts to handle the magnitude of his powers and they spiral out of control making Tetsuo mutate into an enormous bodily blob fusioned with technology. He begins to expand at an accelerated rate and begins to consume all matter surrounding him. Kaneda gets trapped inside of Tesuo and he tells Kaneda that he has killed Kaori through the pressure. As the mass grows, the espers awaken Akira to stop it. 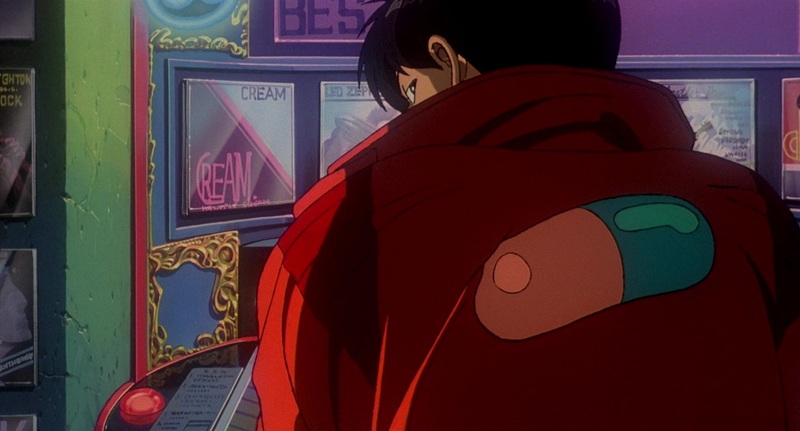 After reuniting with his friends, Akira creates a singularity that draws Tetsuo and Kaneda into another dimension. The espers teleport Shikishima to a safe distance as the singularity destroys Neo-Tokyo in a mirror of Tokyo’s previous destruction, and they agree to rescue Kaneda, knowing that they will not be able to return to this dimension. In the explosion, Kaneda experiences Tetsuo’s and the espers’ childhood, including Tetsuo’s dependence on Kaneda during their childhood, and how the children were trained and altered before Tokyo’s destruction. The espers return Kaneda to his world, informing him that Akira will take Tetsuo to safety and that Kei is developing psychic powers. The singularity disappears and water floods the city. Kaneda discovers that his friends have survived, and they begin to drive off into the ruins of Neo-Tokyo, while Shikishima watches the sunrise. Finally in control of his powers, Tetsuo triggers a big bang to create a parallel universe as God. The characters and dialogue are captivating with the Japanese voice acting being superb. The English dub isn’t as refined, it’s just not on par with the emotion emitted from the Japanese cast. Their voices do fit the characters personality. Previously to my knowledge, the studios did a re-dub for the remastered version of Akira improving sound and changing the voice actors. Western translation aren’t as detailed, the subtitles are more faithful to the Japanese script. While in the hospital, Tetsuo begins to be manipulated through hallucinations brought upon the espers. The games backdrops look absolutely stunning. Colorful and vibrant, smooth transitions and incredible attention to detail made the scenes reflect the amount of dedication put into them. Even the lights in the windows, the holograms and were individually colored to add warmth to the city. In fact, the film’s use of light almost makes the city seem like its a living being. The animators also used CGI to help improve the film’s post-war setting. The soldiers fire the rail cannons towards Tetsuo only anger him even more. His barrier created has great use of lighting and reflection. The story of an older friend always being there to protect his best friend, and his best friend feeling useless, weak. ashamed that he can’t do the same for his only one true friend. He wants to find his own independence but becomes blinded by his own anger. His impulses rage against him and he no longer cares about the consequences of his actions, even if it means hurting innocent people. upon realizing that his true self has been taken over by his hatred, he begins to plead for help, admitting that he is no longer able to control his own addiction towards power by literally imploding and being consumed by it. Through Tetsuos own death, both Kaneda and himself are able to relive through all of Tetsuos childhood memories, embracing his true nature and friendship with each other. Admitting that his conscience is pure even after having been corrupted through all of the events that occurred. As he has now ascended into another dimension, he becomes a superior being with the ability to create the big bang. Akiras influence can still be felt even to this day, 30 years of its release it withstands the test of time. Tetsuos transformation with technology and his bodily fluids are a representation of how the technology in Japan will be their ultimate demise leading to another tragedy for such an awe inspiring country. The scene below shows the depiction of bodily juices overflowing and has become a staple for Japanese horror. Westerns at the time from perceived anime as kid-friendly material but upon viewing scenes with graphic depictions bodily functions created an impact that has run deep within the industry of the horror genre. Tetsuo is now morphing into a horrendous mass of flesh and machine. At first you might not understand everything and many of the details aren’t explained in the movie as they are in the manga. It set the bar for how animation should be produced and directed, allowing many other studios to follow in their success. If you’re truly a film enthusiast then this is one of those movies that you can’t miss out on. You’ll have a great time watching Akira!